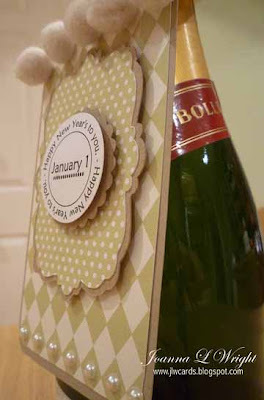 Here I have used one of the Happy New Year printable stamps from The Cutting Cafe on a bottle of Bollinger!. We are visiting my brother's over the holidays and I thought this tag would be a perfect for a lovely bottle of champagne for the New Year! This is the 1st bottle tag that I have ever made and I am quite pleased on how it turned out. It was ever so easy to make and you can embellish them as much as you like. I can't seem to deviate from my projects being girlie, so on this one I resisted to use a bow but I thought with the harlequin paper it would be a suitable gift for my brother and sister in-law. That is, the booze for my brother and the tag for my sister in-law! I am hoping there is not too much snow over the next few days as we have a long journey to Kent and it will be so lovely for the cousins to meet up and all their news. 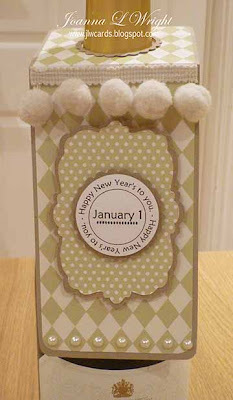 That is fabulous Joanna, I love the pom poms, perfect for this time of year. Lovely tag, the label shape is lovely. Love the papers that you used. Very elegant. Back at The Cutting Cafe! Fabulous Find Winner at Pazzles!